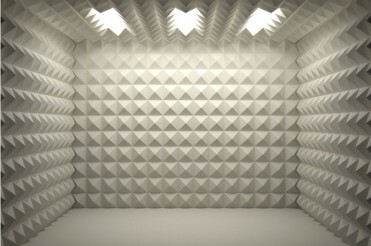 Like any other product category, there are literally hundreds of different manufacturers of soundproofing products. Some are naturally better than others and it is important to know the differences if you hope to purchase professional-grade acoustic products. For the sake of brevity, we will break this article down into a few sections in order to highlight the main product types. Acoustic foam is employed for a number of uses although it most common purpose is to improve the sound within specific areas such as recording studios or home cinemas. One of the main advantages is that a thickness of two inches provides superior sound absorption qualities when compared to traditional materials. Acoustic foam can be purchased in various colours, thicknesses and profiles; helping to create unique aesthetic patterns within a room. Also known as blackout curtains, these drapes can be used to provide variable amounts of sound absorption to internal spaces and reduce ambient noise from external sources (such as a home located close to a main road). Acoustic curtains can be purchased in various colours and material weights to suit a variety of budgets. Gaps or poor fitting seals around windows and doors can significantly reduce the level of sound insulation offered by the window or door. The importance of a good fitting acoustic seal cannot be overstated. Aftermarket acoustic seals are available for windows and doors which, when installed correctly, can improve the level of sound insulation to internal spaces along with additional thermal benefits. These are only three examples of how soundproofing products can be employed to tackle acoustic issues. Please keep in mind that it is always wise to perform additional research. Taking into account factors such as pricing, dimensions and the materials employed will enable you to make the most informed decision. As always, Lighthouse Acoustics would be pleased to provide you with a quotation for professional acoustic advice.